Alazzo Med Spa is committed to making you feel beautiful no matter how small the detail. Skin tags are bothersome and often irritating if they get caught on clothing or jewelry. Don’t live with those annoying little tags any more. 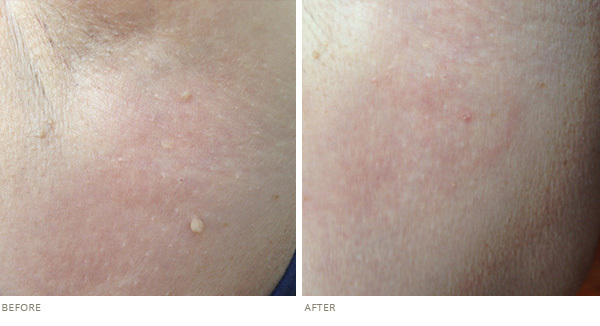 Let us quickly and safely remove those skin tags returning you to the smoother skin that you have grown to love. Q: WHAT IS A SKIN TAG? A: A skin tag, also known as an acrochordon, cutaneous papilloma, cutaneous tag, fibroepithelial polyp, fibroma molluscum, fibroma pendulum, papilloma colli, soft fibroma, and templeton skin tag, is a small tag of skin which may have a peduncle (stalk) – they look like a small piece of soft, hanging skin. Skin tags are very common and generally occur after midlife. Q: WHAT CAUSES A SKIN TAG TO FORM? A: Skin Tags are said to be caused by bunches of collagen and blood vessels which are trapped inside thicker bits of skin. They are believed to be the result of skin rubbing against skin. That is why they are generally found in skin creases and folds. Q: WHERE DO SKIN TAGS FORM? Q: ARE SKIN TAGS DANGEROUS? A: Skin tags are invariably benign – non cancerous – tumors of the skin which cause no symptoms, unless it is repeatedly rubbed or scratched, as may happen with clothing, jewelry, or when shaving. Q: WHY DO SOME PEOPLE GET SKIN TAGS AND OTHERS DON’T? A: Some people are more susceptible to skin tags, either because of being overweight, partly due to heredity, and often for unknown reasons. People with diabetes and pregnant women tend to be more prone to skin tags. Skin tags affect males and females equally.